Rose Coschignano/Pipe Dream Photographer Senior forward Caleb Stewart put up his second consecutive double-double with 26 points and 11 rebounds in a win over Maine. 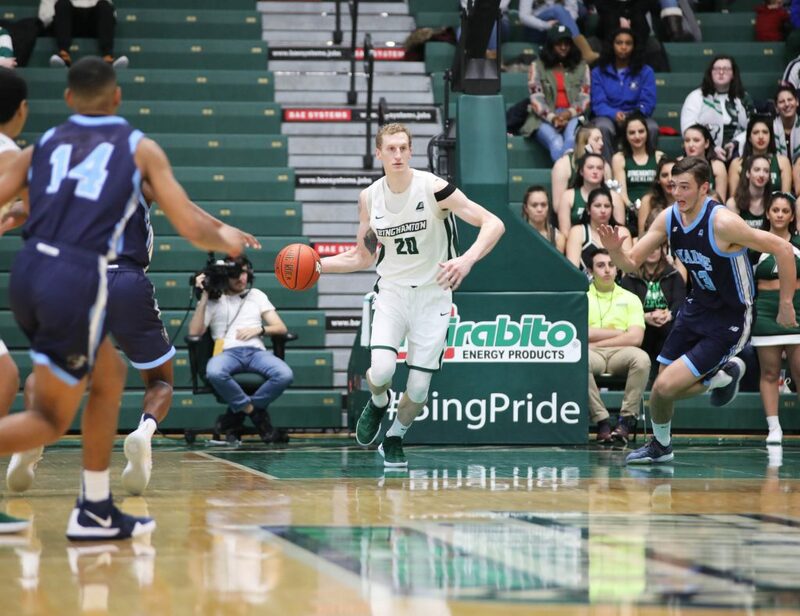 In an electrifying and tightly contested showing this Saturday in the Events Center, the Binghamton men’s basketball team hosted the Maine Black Bears. The Bearcats (6-15, 2-4 America East) triumphed over their opponent, defeating the Black Bears (3-18, 1-5 AE) 78-66. This matchup featured a tremendous showing from senior forward Caleb Stewart, who scored 26 points, sinking five 3-pointers while shooting 83.3 percent from deep. Stewart also grabbed 11 rebounds, achieving his second consecutive double-double, as well as surpassing his previous career-high in points that he registered in the team’s previous game. To cap off the afternoon, Stewart scored his 1,000th career point during the last few seconds of the game. The first half began with BU taking an early lead, which it held onto for the majority of the half. At its largest, the gap was 12 points. While Maine won the jump ball, Stewart scored the first points with an early 3-pointer. While Stewart’s showing was the highlight of the half, the Bearcats demonstrated solid ball movement and profited from assists coming from their guards. Graduate student guard J.C. Show found his teammates inside and beyond the arc, allowing Binghamton to benefit from his court vision. Freshman guard Sam Sessoms also played this role, finding his teammates for some key baskets. As the half drew to a close, the Black Bears rallied on both ends of the court, going on an 11-5 run in the last five minutes of play. During this stretch, a crucial 3-point basket from junior guard Sergio El Darwich was followed up by redshirt junior guard Isaiah White converting a layup against some tight defense from graduate student forward Chancellor Barnard, whose foul on the play led to a 3-point play opportunity. After missing his free throw, both teams traded missed shots from beyond the arc. With 23 seconds remaining, the Bearcats called timeout that preceded the ball being passed around from player to player, until Show fired a three with just two seconds on the clock against tight defense. The shot missed, and the half ended. The Black Bears began the second half continuing the strong play they demonstrated at the first period’s close, going on an 8-0 run to grab the lead, which they were able to extend to seven points before the Bearcats retaliated. Not looking to put the hard work of that first half to waste, BU went on a 20-8 run that lasted for over six minutes and featured points from five players. Show hit two 3-pointers throughout this dominant stretch and was helped by senior guards Timmy Rose and Everson Davis, who each scored 3-pointers of their own. The team then added 10 free throws in the final few minutes, sealing its victory. All of the coaches on both teams were wearing sneakers with their suits to promote Coaches vs. Cancer, a fundraising initiative sponsored by the American Cancer Society. BU shot 54.3 percent from the field for the day, and 48 percent from beyond the arc. The team also led in defensive rebounds, with 27 to Maine’s 20. The Bearcats are scheduled to take on the University of Hartford this Wednesday, Jan. 30. Tipoff is scheduled for 7 p.m. from the Chase Family Arena at the Reich Family Pavilion in West Hartford, Connecticut.